President of the National Academy of Design 1890-1900. Born and raised in Montpelier, Vermont, lived in Boston, MA, Nashville, TN, Louisville, KY and NYC. He was a painter of genre scenes with figures and objects that have meticulous detail. He worked in his father’s cabinet-making shop. In 1846 he studied with Chester Harding in Boston and in 1858 with Hans Gude in Dusseldorf. He also studied in London and Paris, where he had a studio. He worked as a portrait painter in Quebec; Washington, DC; NYC; and Baltimore. In 1867, after years of travel, he established a studio in NYC and became president of the American Water Color Society and a founder of the New York Etching Club. In 1871, he was elected to the National Academy and from 1890 to 1900, was president of the National Academy. He exhibited at National Academy of Design; NY Etching Club; Brooklyn AA; Boston AC; Parrish AM; Art Institute of Chicago; Pennsylvania Academy of Fine Arts Ann. Comments President of the National Academy of Design 1890-1900. 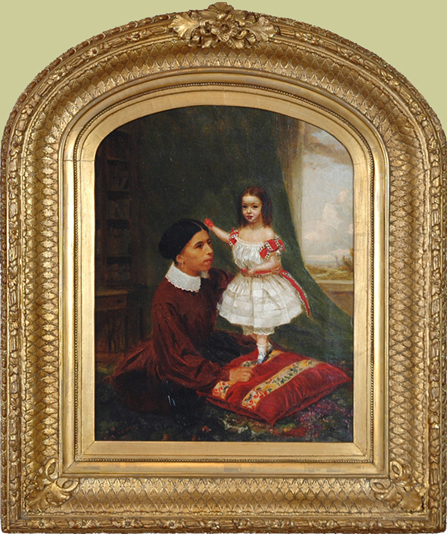 This painting is in excellent condition in the original period frame, also in excellent condition.